For the last few weeks I’ve been kind of quiet on my blog and around the social media outlets I typically frequent. I’ve been trying to focus on my WIP (work-in-progress) but life zinged a few things my way and I ended up feeling overwhelmed. That, of course, resulted me feeling depressed and frustrated. Not a good combination. The house work was piling up, the puppy was ornery, and I stalled again on my WIP. I started wondering if I was just kidding myself with this dream of being a writer. I mean if I can’t even finish the first draft of my book maybe I shouldn’t be trying. Maybe I should just give up. Yep, it was pretty dismal inside my head, until this morning. That’s when I started noticing things. Positive things. It was like life was sending me little messages everywhere I looked. 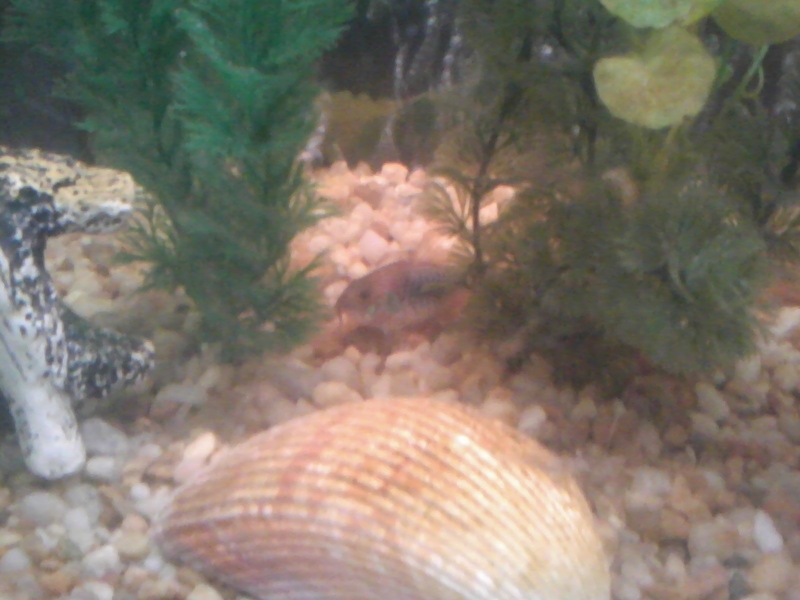 One of my corys hiding by the plants. Well, one morning this past week I woke up to a tank full of green water. There had been an outbreak, and the algae had taken over. Now, cleaning this monster tank was a two person job and it just so happened that my husband picked up a fourth shift at work which meant the tank had to wait. By the second day, I couldn’t see the little guys anymore and figured they had met their demise. That just added to my depressed state: I was a bad fish mommy. But this morning, as I sat on the couch feeling a bit defeated, I saw a quick flash zip from one side of the tank to the other. Upon a closer look, I saw the zebra and glofish hanging out together and soon the neon tetras had joined the group too. They had made it after all. Even when the water was murky and green these little guys didn’t give up. That thought resonated with me through the rest of my day, and soon I started seeing other things. For instance, I saw a tiny baby lizard without a tail. Obviously he had faced a major challenge in life but he sure didn’t give up. So what if he’d have to grow a new tail? That was a whole lot better than being eaten. Jake's smiling for the camera. And Jake the puppy didn’t let a bit of gray sky and rain ruin his day. He couldn’t romp around outside like he normally does, but he sure did give his inside toys a workout. He’s always in a good mood – see that smile? It was like the world around me was giving me advice when I needed to hear it the most. It said, “Don’t give up in the face of a few tough challenges.” I decided that was awesome advice. So from now on I’ll swim to the other side, even if I can’t see it in the green murky waters, and I’ll do it with a smile because its better to be alive than be eaten. I’d love for you to share your experiences with me. Has life ever sent you messages before? How do you handle things when life gets overwhelming or stressful?